November 4th, 2017, the full moon day of the 9th Tibetan month, will mark the 49th day since the passing into liberation of His Holiness 33rd Menri Trizen Lungtok Tenpa’i Nyima Rinpoche. Although His Holiness has liberated and therefore has no need for traveling through the experience of the six realms of cyclic existence in the bardo, these 49 days are marked as an auspicious time to make offerings and perform virtue in order to generate powerful benefit for both ourselves and others. For ordinary beings who have died, we make offerings and perform ritual in order to support them. In this case, we make offerings and perform ritual to generate merit which we dedicate for the benefit of all suffering beings. This is also a powerful time to connect with the presence of His Holiness, receive his blessings, renew commitments made to him, and to remember the teachings and guidance that he offered. 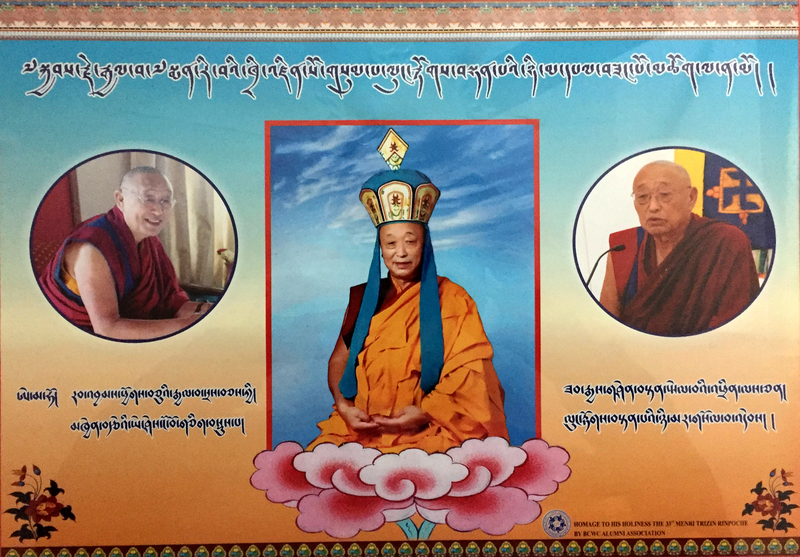 At Menri Monastery in Dolanji, India the prayer Offerings for the Lama has been recited regularly since the passing of His Holiness 33rd Menri Trizen Rinpoche. This prayer will be one of the prayers offered on the 49th day. 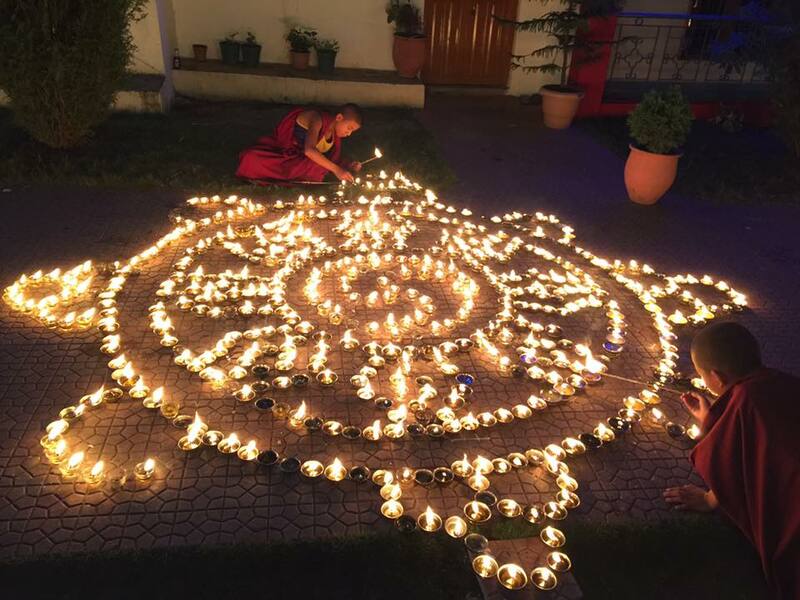 It is also appropriate to offer butter lamps or candles, perform the prayer specific for His Holiness, perform guru yoga emphasizing the presence of His Holiness, or abide in the natural state of the mind. is the spiritual master, the essence of the Enlightened Ones of the three times. within an unsurpassed palace of the immeasurable three places. prostrating with my arms, legs and head! chanting with a joyous and inspired melody! prostrating with single-pointed motivation and devotion! May the negative actions and defilements of my three doors become purified! I admit my actions of wrongdoing and non-virtue. I admit corrupting the three vows and defiling the promises that I’ve made. I admit my pretension even though not understanding the nature of mind. Please bestow complete purification and the supreme attainment! I present unequaled external, internal, and secret offerings. Externally, I offer the environment and the beings within it. Furthermore, I offer my own body and its vitality as an ornament. I present these offerings with non-attachment. Internally, I offer the arising of my mental and physical aggregates. I offer my accumulated realization that whatever arises as a subject and object is illusory. Furthermore, I present these offerings within the vast space of self-liberation. which is unceasing, and understands whatever arises as enlightened manifestation and wisdom. Furthermore, I present these offerings within a completely vast and all-pervasive space. Free from extremes and unchanging is the container of my mind. Free from elaborations, I establish the wick of great self-liberation. I fill the lamp of authentic, completely pervasive great bliss. To the One who has characteristics, I present this butter lamp to look upon with the eye. is filled with the non-grasping, radiantly clear light of pure incense. The fresh and continuous smoke permeates everywhere. I present this incense to the Protector of beings. is filled with unobstructed, playfully self-arising offering water. I present this offering water for the enjoyment of the Dimension of great kindness. is filled with manifested experience and realization like the utpal flower. I present this flower of enlightened activity to the Heart of great kindness. abides the state of Künzang, completely equipoised and free from extremes. please hold the migrating beings of the six realms in your compassion and loosen the mind-stream! are the peaceful and wrathful deities who have the major and minor characteristics. the One who teaches whatever is needed and performs a variety of enlightened activity. please bestow benefits that are as limitless as the sky to migrating beings! Please grant our wishes to be continuously without separation from your presence! Continuously hold us with your unequalled compassion! may I obtain a body of renunciation with the advantages of the leisures and fortunes. may I accomplish benefit that is equal to the vastness of the sky! Raven Cypress Wood ©2017 All Rights Reserved. No other distribution or publication allowed. Posted on November 4, 2017, in Tibetan Lamas, Translation, Uncategorized. Bookmark the permalink. 3 Comments. warm thanks for your wonderful work.